Our destination is on a high plain some 120 kilometers south of Kabul: a barren area that the native population calls simply "Dasht": desert. About ten minutes earlier we turned off the main road and now we are advancing with difficulty over sand and gravel. It is a bright, beautiful day. The sunlight is like mica glistening out of a steely blue sky. The car must be somewhere out in front of us: a white Toyota Corolla that is supposed to take us to our scheduled meeting. Our investigations are almost completed. We have been waiting for days for this moment to arrive. We shut off the motor. We wait. Four or five minutes pass. We stay perfectly still. The wind is whistling softly around our car, increasing our unease. Finally, we hear the sound of motors. It is not a car, however, but rather the rattling of motorcycles. Suddenly, before we can look around, they are standing before us: five Taliban with wide-eyed expressions. They seem to have come out of nowhere. They hold their Kalashnikovs against the windows, drag us out of the car and confiscate our cellphones. They tie our hands together on our backs with rags and they push us back into the car. As if paralyzed by the shock, we cannot make a sound. Only Nathan, the photographer, manages to say: "Now we're finished." As the doors are slammed shut, the acid smell of perspiration pierces our nostrils. In the hot humid air, we then make out the sweaty faces of the two Taliban who have occupied the front seats. One of them has a bloated face with Asiatic features and the hands of a butcher. His beard hangs a fist's breadth over his ammunition vest. He is highly concentrated on the intricacies of his driving technique and his head is bent down low over the dashboard. The other has a noble air. He has a thinly-chiseled nose and high cheekbones. With his wild hair and his eyelids blackened with kajal, he resembles Johnny Depp in "The Pirates of the Caribbean" -- only he is not as funny as the pirate in the film. The kidnappers are obviously in a big hurry to get us away from the place where they seized us. The driver presses the pedal heavily to the floor, making the car shoot forward like a bullet, only then in the next moment to slam on the breaks. With every bump in the terrain, the car shakes so violently that our heads hit the roof. The Taliban have forced the four of us -- our driver Ismael, Nathan the photographer, the reporter Sami, and myself -- into the backseat. At first they wanted to put Ismael in the trunk, but our loud protests managed to dissuade them. From the passenger seat, the "pirate" points his Kalashnikov at our heads. Our precarious situation strikes us as a cynical stroke of fate. We had been supposed to meet a Taliban commander by the name of Fazlullah, who was going to explain to us the combat methods used by the holy warriors. We did not want to report from the outside. We wanted to have the inside story. We wanted to learn how the Taliban think, how they live, how they talk amongst themselves. Now, for unexplained reasons, we had ourselves fallen into their power. Together with Sami Yousafzai, correspondent for Newsweek and one of the most knowledgeable students of the region, I had been trying for years to make contact with the Taliban. We had repeatedly gone into the area under their control. We observed how they regrouped in neighboring Pakistan following their expulsion from Afghanistan. In fall 2004, we saw how they for the first time ventured to appear publicly again in the city of Quetta -- with the Pakistani government's silent consent. We witnessed how they returned to Afghanistan, how they terrorized the population, how they burnt down schools. At the beginning of 2006, we finally managed to establish contact with one of their high officials: Mullah Mohammed Sabir, the Taliban governor of Ghazni province and a member of the Shura, the Taliban's highest council. In March, we had our first direct encounter with Sabir. Sami pleaded with him to organize a meeting with his fighters. Sabir made no promises. He wanted first to see the outcome of the planned summer offensive. "Maybe in the fall before the gates of Kabul" were his words as he left us. The air in the car is getting stickier by the minute as it hurtles over the rocky desert terrain. Behind us we hear two motorcycles on which the other three Taliban are apparently following. Our mood is changing every few seconds. After the first shock, we regain our composure and we try to make eye contact with the two kidnappers. We try to read their expressions: searching for a humane gesture or any other reassuring sign. But the two remain inscrutable. The "butcher" and the "pirate" are barely twenty years old. They say nothing, their movements are impetuous, their dark eyes flash nervously surveying the area. Sami tries to engage them in conversation. He explains in Pashto that we are journalists and that we had an invitation from Fazlullah, the local Taliban chief. Judging from the expression on their faces, the kidnappers appear to know our host. But they do not react. When they hear that the meeting had been personally arranged by the provincial Taliban governor Mullah Sabir, they briefly exchange glances, but they seem unimpressed. Who are they? Have we fallen into a trap? Did Mullah Sabir betray us? Our contact to Mullah Sabir had turned out to be a laborious affair. After our first meeting in March, we left several messages with his intermediaries. But he did not respond. Evidently, he was not interested in another meeting. Since spring, the Taliban have rapidly extended the area under their control. Crossing the border from Pakistan, they sent more and more fighters into the field, conquered one hilltop after another, and penetrated ever more deeply into the interior of the country. In the distant valleys and regions, they filled a power vacuum that had been created by the insufficient number of the Allied forces (40,000 soldiers). In summer, they advanced to within fifty kilometers of Kabul. The authority of Hamid Karzai's central government melted back to cities and towns. In mid-summer, Mullah Sabir surprised us by granting us a brief visit. He received us in his home province of Ghazni along with the chief correspondent of CBS news. In a village barely five kilometers off the main road connecting Kabul and Kandahar, he had gathered some hundred fighters: wild, rugged mountain men and peasants, ranging from teenagers to grandfathers, dressed in motley clothing. It was striking that a new type of recruit was to be found in their ranks. These were no longer the original Taliban: the black-robed, religiously indoctrinated holy warriors who founded the Taliban movement in the 1990's from out of the Koran schools. In Sabir's troops, there were many "nobodies" without training in the Koran. They looked like they had been recruited directly from the fields or off the street. The most crucial common denominator that united the new and the old Taliban was their resistance against the invaders: an originary trait of the Pashtun people that over hundreds of years had defied every foreign power and submitted to no one. Mullah Sabir led his fighters in prayer in a field and let them pose for the cameras with their weapons. "One year ago, we would not have dared to do this even at midnight. Now we do it in broad daylight." Sabir's message was clear: Look, we're back and no one can stop us. Then he disappeared with his band of fighters without saying another word to us. It was a brief, bizarre encounter. The pictures that came out of this meeting figure among the very few recent images that exist of the Taliban. We are driving over a hilltop. The car runs into a patch of sand. For a moment, we are stuck. Then the tires regain their grip. The kidnappers are visibly relieved. Sami takes advantage of the brief break in the tension to make another overture. Sami is himself Afghan and a member of one of the largest Pashtun tribes. He tries to appeal to Muslim virtues: this is not the right way to behave toward fellow Muslims and their guests. They cut him off: "You're no one to be giving us lessons. You're a friend of the unbelievers." When Sami asks what they intend to do with us, the "pirate" snarls at him icily. We do not know what he has said. Sami keeps quiet. But we can see from his facial expression that he is worried. "What's he say?" I whisper. "I think they're bringing us to their village." "What do they want to do there?" "Probably..." "Harkat makawa! [Shut up!]" the "pirate" screams and he places the barrel of his gun against Sami's forehead. Since Mullah Sabir's Taliban parade in the summer, we had repeatedly made known that we wanted to have a chance to speak at greater length with some of his fighters. Sabir was a chubby bear of a man. With his flowing baritone, he gave the impression of being a benevolent ruler. But his mild appearance was deceiving. He was ruthless with his fighters and unconcerned by losses in battle. He seemed to allow nothing and no one to influence his decisions. We received the same treatment. When the moment for a meeting seemed right to him, he would let us know. And now the time had come. In the fall, Mullah Sabir informed us that a group would receive us at the beginning of November south of Ghazni. The meeting was supposed to take place in Andar district: a stronghold of the resistance. In late October, we set off. In order to form a detailed picture of the Afghan resistance, we first visited a division of the Allied troops that was stationed in the region. The U.S. military flew us to the 10th Mountain Division in Gardez in Paktia province. In spring 2002, the province had been the theatre of Operation Anaconda: the last battle with the residues of the fallen Taliban regime. Now the zealots were back. The holy warriors were not actually to be seen, but the fear of them was everywhere perceptible among the population. They were evidently able to launch ambushes whenever they wanted. "They're like mosquitoes," one American soldier said, "You barely hear them and then suddenly they bite you." Just before our arrival, a suicide bomber had blown himself up in front of the U.S. base. It was the 88th suicide attack in Afghanistan since the start of the year. We asked the head watchman in the U.S. camp, an Afghan who had fought shoulder to shoulder with the Americans during Operation Anaconda, whether he knew where the bombers came from. He shook his head: "Every time I see one, he's already been blown to pieces." He insisted, however, that they are not Afghans. "The last one in front of the camp had yellow hair." He meant blond actually and he wanted to imply by that the terrorists come from distant, foreign lands: Afghans, proud warriors, would never commit such cowardly acts. Presumably he knew better, but was ashamed by the suicide attacks: a phenomenon that was new to the Hindu Kush. In the photos that an officer had made of the dead bomber, the Pashtun facial features were clearly recognizable. Apart from the head and the lower parts of his legs, which lay on the street bizarrely disarticulated, the rest of his body had been completely blown to bits. The head was cut off clean just under the chin: the powerful force of the explosion had popped it off like the lid of a barrel. There was hardly a scratch. Only the tip of his black beard had been singed white. As far as Sabir was concerned, it was certain that the majority of the bombers were Afghans. According to him, hundreds had volunteered. He called them the Taliban's new "miracle weapon," with the help of which they would soon reconquer all of Afghanistan. What do they want with us? This question is ringing in our heads. If the kidnappers would only listen to us, it would be easy to make clear our identities and our intentions. We all have our passports and our professional IDs. Our equipment, moreover, points to our journalistic work. But it quickly dawns on me how ridiculous such a thought is. The kidnappers could not care less. Would they shoot us? Again I begin to have some hope. Their abrupt seizure of us, the rapid getaway, the cold-blooded demeanor -- all of that suggests rather a planned hostage-taking. Such cases have become more and more frequent in Afghanistan lately. Three weeks earlier, the Italian photojournalist Gabriele Torsello had been kidnapped in the south. Two days ago, we heard on the radio that he had been found unharmed on a street in Kandahar. It was a mysterious affair. The Italian government denied rumors about a substantial ransom payment. It turned out that Torsello had converted to Islam long ago. Maybe that saved his life. Once they had taken us to their hiding place, they were surely going to search us carefully. Do we have anything on us that could cause problems? "Is your camera clean?" I ask the photographer. Nathan had brought along a brand new digital camera, which the "pirate" had snatched away from him and which was now lying up front next to his feet. Luckily, he tells me, he has transferred all the pictures from our last trip to his computer in the hotel and erased them from the memory card. Among them, there were numerous photographs of American soldiers. Some of them would have created considerable difficulties for us in our present situation. Our trip with the Americans had taken us through the over 9,000-foot high Tara mountain pass to Puli Alam in Logar province. The army maintains a Forward Operations Base (FOB) there: one of the smallest American bases in Afghanistan. 45 men and 15 women live together in cramped quarters in a converted schoolhouse. When we arrived in the camp, we met soldiers who had been on the front already for ten months without a single day of home leave. Every day they devoted themselves to their mission. Their motto was "Fight and Build": an assignment that included renovating buildings, digging wells, and rebuilding destroyed girls schools. "We're fighting here neither for land nor for power," an American officer explained: the fight is a fight rather to win the favor of the people. "Whoever wins over the population, wins the war." The Taliban knew that too. Their strategy was as brutal as it was effective. The American officer explained it as follows: "The Taliban know that the broad public will not willingly support them. So, they try to force people to take their side through terror. First, they shoot the night watchman of a school. Then they shoot a couple of policemen. Then a provincial Governor. With each murder, the people grow more frightened and they take their distance from us and the Afghan authorities. Finally, the state stops functioning." The struggle for the population is tiring and frustrating, the officer says: "It's as if we were courting a woman who does not dare to leave her husband who beats her." Three days after our arrival, a large-scale hunt for Taliban was launched. Just after midday, a column of U.S. armored vehicles set in motion led by four Toyota pick-ups packed to the sides with Afghan police and soldiers. Apart from the officers, no one knew where they were headed. According to an Afghan intelligence officer, a man of a brusque nature with a snow white crew cut and blue eyes, targets had repeatedly been given away by some of his soldiers. "An Afghan soldier earns two and a half dollars per day," he explained, "The Taliban pay double that." 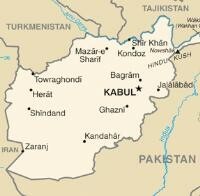 The Afghans took the lead and stormed several farms. But they failed to find any suspects. In low spirits, the convoy moved on to ever more remote hamlets. All of a sudden, a white figure was spotted running across a field a couple of hundred meters away and disappearing into a farm house. Three minutes later, the fugitive had been caught. The soldiers found him hidden beneath a burqa in the women's room and they pulled him out of the house. Like busy bees, Afghan intelligence officers whirred through the rooms confiscating suspicious material. "Death to the Christians" was written on a pamphlet that they pulled out from under a bed. In a cash box, they found Pakistani rupees worth a couple of thousand dollars. Gesticulating wildly, the suspect offered ever more bewildering explanations. With his white robe, pointy beard and watery eyes, he looked like a Pashtun holy man. For the Afghan intelligence officers, there was no doubt that he was a Taliban. Dragging him around like a trophy, they brought him to their vehicles. The heart-wrenching cries of the women could be heard coming from the yard. "Do you want to arrest the whole village?" an old woman yelled out the door as they drove the "holy man" away chained to a pick-up. It comes to me in a flash: on my digital camera, which I am carrying in a pouch on my belt, there are pictures of a captured Taliban. I had gotten into the habit of taking photos of key figures in my research. I have ten or so pictures of the scene saved on the camera. Our kidnappers, who did not give the impression of being especially bright, would surely assume that we were spies or that we were in bed with their enemies, the Americans. Something else occurs to me: something possibly even worse. On the memory card, there are also pictures from our family vacation in Italy. In the fall, we had visited Rome, where by accident we found ourselves in St. Peter's Square to observe the Pope's weekly audience. As Benedict XVI drove by us in the Popemobile, he waved directly toward my camera. I had proudly shown the picture around to my colleagues. But here, in this desolate situation, the picture of a smiling Benedict is a bad omen -- especially since the Pope had been declared a mortal enemy by the Islamists following his controversial remarks about Islam in Regensburg. Such pronouncements spread like the wind to the most remote valleys in the Hindu Kush. In the markets of Afghanistan and Pakistan, we had come upon a new phenomenon. The Taliban had started to copy conspiracy-theorizing Arab propaganda about the oppression of Muslims by the West. Cheaply produced videos documenting the "humiliation" of the Taliban were to be found in circulation more and more frequently: images of Afghan soldiers poking with their weapons at dead Taliban; of Special Forces burning their bodies. In these films, the Taliban portrayed their struggle as part of the greater struggle of the Umma: the "global family" of Islam. Although the Taliban insurgency had its own roots, growing out of a complex weave of local disputes and power struggles, the Taliban were clearly looking to connect to international networks. "The Taliban of the nineties were backwoodsmen and very focused on their district or province," a high official of the Supreme Court in Kabul told us, "Now they've joined the world." "Nathan, untie my hands," I whisper to the photographer. He looks at me with wide eyes: "Are you nuts?!" My hands still tied, I open the small pouch on the belt, take out the camera, extract the memory card behind my back and push the flat card between the seat and the backrest. I almost have the camera back in the pouch when the "pirate" registers my movements. With lightning reflexes, he swings the barrel of his gun against my chest. At that moment, a shot rings out behind the car. The "butcher" slams on the breaks, jumps out of the car, and points his Kalashnikov in the direction of the shot. We duck down as best we can in the cramped space, fearing that a wild exchange of fire is about to break out. But instead of fire, we hear screaming that is quickly approaching the car. A roughly forty-year-old man comes running towards us: a pudgy, dwarfish figure with a pug-nose and a dirty turban. Making gruff sounds, he orders around the "butcher," opens the door and tells us to get out. Apparently it was he who fired the shot: most likely, a warning shot to get the kidnappers to stop the car. For a moment we think that the man is an envoy of our host Fazlullah, who had now come rushing to our rescue after all. Surely, he was going to tell off the kidnappers and then take us to his village as planned. Soon, however, we realize that he must be the kidnapper's chief. The "pirate" and the "butcher" bow and scrape before him like schoolboys. Judging from his comportment, the older guy seems to be angry about the youngsters' reckless behavior. Inexperience and impulsiveness are widespread among the younger Taliban and they often have a high cost. We found this out during our meeting with Mullah Sabir's foot soldiers a few days earlier. This was the meeting in the Andar region south of Ghazni that Mullah Sabir had organized for us. Two of his fighters -- Hamidullah, 23, and Abdulmateen, 22 -- met us in an abandoned house and took us to a small village. Hamidullah rode on a red 125cc Kawasaki. With the sheepskin that he had draped over the gas tank, it looked like a metallic horse with a mane. We had barely arrived in the village when the local youngsters began streaming into the street and crowding around the two Taliban. The adolescent kids listened enthusiastically as the Taliban told us about their lives. Hamidullah related how they had hidden their weapons in the nearby hills. Every evening the group split up, hiding one by one or in pairs in different houses. There was no lack of room and board, they said: the population is glad about their presence, no one trusts the corrupt authorities. It was clear that the Taliban would have no problem attracting new recruits. The young people regarded them as heroic freedom fighters. Some said that their highest goal in life was to become a Taliban. Nonetheless, the struggle against the invaders was only one of the reasons for this fascination with the holy warriors. With surprising frankness, Hamidullah said that the Taliban are often the only way out of unemployment for the impoverished village youth. The fighters are well looked after. They get shoes, winter jackets, and good salaries. That was not, however, the whole truth. Apparently, there had even developed a competition to attract new recruits. As the youngsters from the village told us, different groups of Taliban courted new fighters with attractive offers like cellphones and even motorcycles. The different groups were suspicious of one another and there had already been clashes among them. We were on the other side of the world, but the stories spontaneously reminded me of the gang wars between Jets and Sharks in "West Side Story." We had brought Hamidullah and Abdulmateen a couple of copies of the latest issue of Newsweek, whose cover story was about the rise of the Taliban. The cover featured a picture of one of their fellow fighters: a twenty-year-old Taliban named Nasir from Ghazni. The two of them flipped through the pages. They were strangely moved by the sight of their comrade on the cover. "Look how mean he looks," Hamidullah said, "God have mercy on him." We now find out that Nasir -- who on the cover strikes a martial pose with a rocket-launcher -- had died just a few days ago. The two Taliban are reluctant to talk about it. "A mishap," Hamidullah says. Supposedly, it occurred as Nasir's group was trying to liquidate a "traitor": an Afghan who had offered his services to the local authorities. Nasir, the rocket man, and ten other fighters baited him into an ambush. As Nasir walked up to the car of the "traitor," the latter pulled a revolver from under his seat and shot Nasir in the neck. He died on the spot. The case was extremely embarrassing for the Taliban -- all the more so since the "traitor" even managed to escape. They told other Taliban groups that Nasir was killed by friendly fire in an unfortunate accident in the heat of battle. Once the older guy has put the "pirate" and the "butcher" in their place, he rushes toward the other kidnappers, who are waiting a hundred meters behind us on their motorcycles. Unlike their colleagues, still standing abashedly next to us, the three motorcycle fighters do not back down. They protest. A vehement discussion ensues. Obviously, there is no agreement on what to do with us. A couple of weeks ago, Mullah Sabir had spoken to us about a new Taliban code of conduct. This so-called Layeha comprised thirty rules and was authorized by the Taliban's supreme leader: the legendary Mullah Omar. It was striking how many of the points concerned matters of discipline. It was explicitly prohibited to rob civilians and to take revenge on prisoners. The rulebook, of which Mullah Sabir provided us a copy, clearly shows that discipline among the Taliban leaves much to be desired. The more power the Taliban conquered, the more their organization seemed to suffer. Sabir confirmed that internal rivalries were increasingly a problem of late. I speculate that the dispute raging among our kidnappers might be an example of such disarray. Now the tide seems to have turned. The older guy, who first seemed like a savior to us, orders his men to empty our pockets. Passports, wallets, several hundred dollars, digital camera, even my glasses -- everything is taken away from us and thrown into a pile on the sand. Then he walks up to us, points his gun and orders: "Get down on your knees, in a row!" Up to this moment, I had never been without hope. Now, though, my inner resources are exhausted. I try desperately to convince myself that a life cannot end so pointlessly. But, at the same time, I know that hostage-takings often come to such a banal and tragic ending. Nathan is kneeling to my left. The driver Ismael to my right. He has moved about a yard away from me, as if he believed that greater distance from the "unbelievers" might prolong his life somewhat. It goes through my mind how pathetic such moments are represented in literature and film. Those condemned to death often have profound thoughts, sentimental memories or a last wish. Nothing of the sort occurs to me. My heart is pounding too fast; the spikes of adrenaline are too violent. In these fearful moments facing death, the only thing of which I am aware is an extreme dryness in my throat, as if I had swallowed a liter of honey. They start to argue again. Intolerable minutes pass. At one point, they want to cover our eyes, but they do not have any cloth. I want to scream for help. But as far as one can see there are neither houses nor people. Everything here breathes solitude. Whatever is going to happen, no one will bear witness. All at once, the ground falls out from under me. The thought that I have been suppressing the whole time pitilessly overtakes me: the thought of my home, my wife, my children. I remember how my four-year-old daughter asked me as I was leaving whether I was going to visit bad people again. "No," I lied to her: there were not any bad people, just good ones and less good. Would she ever forgive me? Now the "pirate" trudges over to us. Following the boss's orders, he picks our documents and papers out of the sand and transfers them to the car. Several times, the motor is started and then shut off again. All the kidnappers rush to the car. Only the older guy stays with us. Slowly, he comes closer with his gun pointed. He goes around us and suddenly he is standing directly behind me. With a tug he pulls at the rags with which my hands are tied. Two or three hand movements and my arms are free. Then he unties the others. He screams at us and with a wild gesture makes it clear that we are supposed to run away. But where? And what if they shoot us in the back? Such thoughts are instantly forgotten. Instinctively, the legs begin to move. First hesitantly and then faster and faster, we run through the desert. Only the driver Ismael stays put, pleading for his car: it belongs to his uncle, he did not want to come along, if it was not for his marriage, he would never have left Kabul. He still needs 700 dollars to get married, he explains to the puzzled Taliban. If they do not give him back the car, he will never be able to start a family. The boss is completely unmoved by Ismael's whining. With a menacing wave of the hand, he chases him away. As we notice that the Taliban have also left and are driving in the other direction, we stop briefly to catch our breath. With dusk rapidly falling, we then get on our way again, walking in the direction of the main road from which we had turned off in the afternoon. In twenty minutes, we have reached our goal. Coarse, dark asphalt: never before in our lives had a road meant so much protection, such a feeling of security. "Where the road ends, that's where the reign of the Taliban begins," an old man in Ghazni told us before we left for our appointment. There is not another phrase that describes the situation in Afghanistan so well. The first vehicle that we see is a truck. When the driver hears that we have been ambushed by the Taliban, he waves us off and drives on quickly. A little bit later, a businessman in a new Toyota takes pity on us and drives us to the nearest village. "We are caught between two evils," he says, by which he evidently means the Taliban and the Americans. He rolls up his sleeve and shows us the scar from a bullet wound: "AK-47 -- Boom! Boom!" We shudder. Our rescuer laughs a stoic, sarcastic laugh, such as only Pashtun can, and he hands us a water bottle. Six hours after our liberation, we finally make contact with Mullah Sabir. He is in an agitated mood. Fazlullah had inquired about us: where were we? When he hears about the kidnapping, he is shaking with rage. He regards the matter as a personal insult and a challenge to his authority. He promises personally to hold the perpetrators accountable. Then he hangs up. Over the next few days, bit by bit we learn more about our case and the pieces of the puzzle start to fit together. One hour before our scheduled arrival, our host Fazlullah had informed his group about our visit. One of his fighters passed on the information to a rival group. Driven by greed and recklessness, they had set a trap. Sabir confirmed that the kidnappers wanted to take us hostage in the hope of being able to extort a large ransom payment. When their boss, whom they had not informed of their plans, heard about the matter, he sped after them. He understood that a kidnapping would cause problems for him, since as guests we were supposed to enjoy the protection of Fazlullah, and he brought a halt to the enterprise. The temptation to rob us, however, was too much for him to resist. As Nathan and I were waiting for new passports from the Swiss Embassy, Sami traveled to Quetta to see Sabir and ask for our equipment back. Thanks to the laissez-faire attitude of the Pakistani government, the city on the border with Afghanistan has become a headquarters for the Taliban leadership. Mullah Sabir meets here with other cadres and hammers out plans for the coming winter offensive. "Mullah Sabir," Sami asks, "How do you plan to rule the country when you don't have your own people under control?" "You'll get your material back," Sabir answers indignantly. "In a couple of days, you'll have everything. I guarantee it." Mullah Sabir keeps his word. Four days after the kidnapping, the car, all the photographic equipment, the passports, and my notebook are ready to be picked up at a designated location. Sabir's honor has been restored. He even invites us to meet him again: "Next year in Kabul, God willing!" These are empty words. Sabir knows that he cannot take the capitol so long as the Allied troops are in the country. He knows that the Taliban and the NATO troops share the same fate: they are both too strong to lose, but too weak to win. But Sabir believes that time is on his side: "The West has the better weapons, but we can hold our breath longer." He is convinced that the Taliban's terror will grind down the West. At some point, the pressure will be too much for people in the West: then the unholy invaders will withdraw. "That day," Mullah Sabir says, "will be the day of our triumph." Urs Gehriger is a correspondent of the Swiss weekly Die Weltwoche. Sami Yousafzai is a special correspondent for Newsweek based in Peshawar, Pakistan, and a frequent contributor to Die Weltwoche. This article first appeared in German in the December 14 issue of Die Weltwoche. (Issue 51-52/06). The English translation is by John Rosenthal.